Each side of this jumbo Janus measures 192 square feet, a ton of marketing real estate, anchored alongside a major arterial. Thousands, possibly tens of thousands of motorists drive past this towering teaser every day. And the advertising messages that flash and pop on its gigantic screen have something extra going for them, something that is missing when similar messages appear on the printed page of a newspaper or magazine: they’re intrusive! Intrusiveness in advertising is important. It gives the message a fighting chance to jump out of its context, breach the eye gate or the ear gate, and lodge itself in the brain of the consumer. 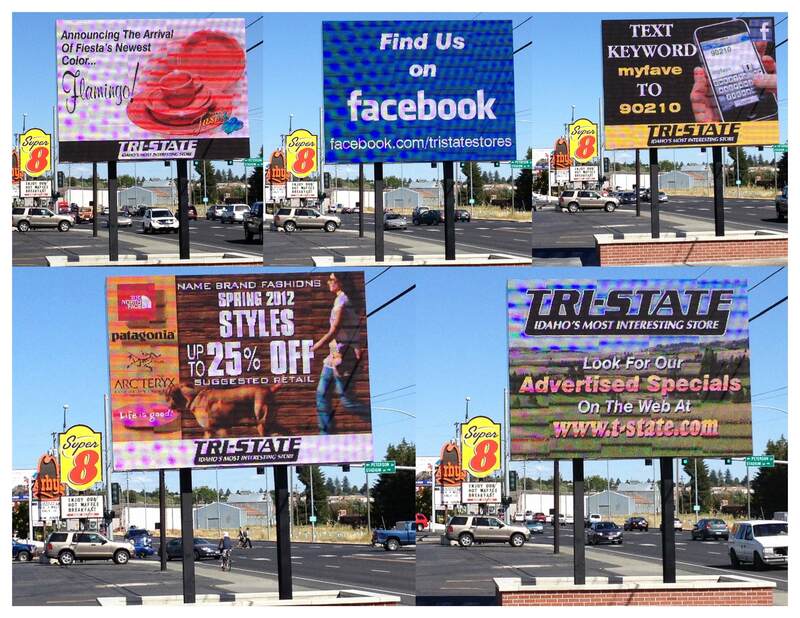 One of the factors affecting the potency of outdoor signage is location. In the market where I live most billboards are set back so far from the roadway, lack of proximity alone makes them ineffectual. Couple these poor locations with the tendency of too many advertisers to cram too much information onto that small canvas, and you’ve added insult to injury. Next time, just burn the money in your fireplace and at least you’ll get something out of it. But these animated LED displays are a whole other thing, situated right along the sidewalk at the perfect height above motorists to catch their attention. And unlike billboards, whose messages can’t easily be changed, these computer-controlled electronic signs can display an endless variety of messages, a new one every few seconds, in dazzling color, brilliant high-def graphics and eye-popping text…mesmerizing, indeed. And therein lies the problem, according to some motorists and others who’ve complained to their elected officials that such signs pose an imminent hazard to other motorists and to pedestrians trying to cross the street, for example, and finding themselves forced to compete with the big sign for the attention of drivers, distracted by the deal of the day. Now, in view of recent legislation making texting-while-driving illegal (in addition to being intrinsically stupid) throwing up a sign exhorting viewers to “text keyword myfave to 90210” wasn’t the smartest move on Tri-State’s part. But that’s a messaging issue. Something else makes these signs attractive to me. They give the advertiser an opportunity to own his own advertising medium, and not just rent it. As I write this, the Moscow, ID City Council has recently enacted an emergency ordinance governing new signs, providing a window of 182 days for them to study the effects of the ones already in place. As they debate the issues of free speech and free markets over against the public welfare, it remains to be seen how many other businesses will be able to follow Tri-State’s lead. Tri-State erected its sign within the framework of existing codes and will likely enjoy the protection of being grandfathered, regardless of the outcome of the council’s discussions. If limitations are placed on future sign installations, competitors may argue that city government has given an unfair competitive advantage to one business over another. This entry was posted in Advertising (General), Billboard, Business, Communication, Copy, graphic design, information overload, Magazine, Newspaper, Positioning, Print, Promotions, Proofreading, Radio Advertising, Sales, Sales & Marketing, Shop Local, Sign, Slogans and taglines, Uncategorized and tagged Advertising, driving, electronic, Idaho, magazine, marketing, media, Moscow, Newspaper, ordinance, print, readerboard, sign, texting, Tri-State. Bookmark the permalink.